What better time to buy New Order shares than Christmastime*? * Formerly "the winter holiday season". As our friends in New Zealand and Australia remind us, not everyone celebrates winter in December. 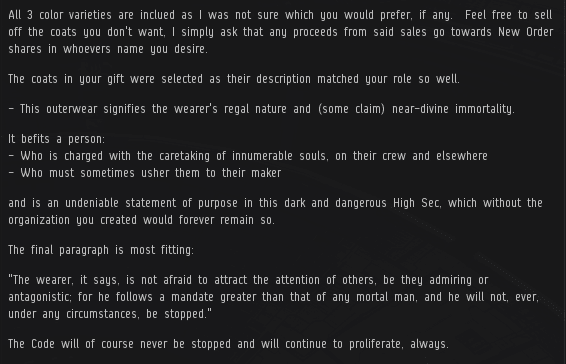 Things are heating up: Adelaide Brooke's purchase of 1,000 shares earned her a Supreme Protector's Tip of the Hat™ for sending us over the 793 billion isk mark. We're quickly approaching the all-important 4/5 trillion mark. Say, what's that sound? Could it be sleigh bells and reindeer? I wonder what's inside? Okay, that's enough anticipation. 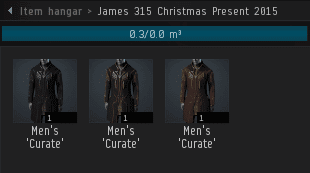 It's almost as if CCP created this stuff with me in mind. Spooky. As a man known for his authenticity and independence, I'd like to leave this question to a New Order focus group. Which coat do you prefer? What a thoughtful gift from Agent Kalorned! I say gold fits him the best. It underlines the purity and establishes the regal supremacy of the savior! FYI, Christmas Presents are pointedly not scams, unless you are one of or similar to one of those foul pretentious children who believe that Christmas is a time for getting presents. You probably are someone who also obliviously thinks EA is an excellently run game studio, as the resulting result of your infantine pettiness. Thanks for that speech "Ming, the coward"
I must agree with Jacqueline; I believe that the Red/Gold Coat would suit our Saviour the best. The regal red signifies Our Saviour's Royalty, as well as His Vigour and Deadliness when it comes to combat, and rightly represents The Saviour's purview of enforcing the Code, while the Gold signifies His Divine Nature, and the Mercy that he continually shows the residents of James 315 Space, by bestowing the Code and being accessible to His subjects. Yes, Red/Gold would be my choice. You know, it should be in the Code that miners and others should be dressed correctly at all times. Proper satorial laws should be composed, voted upon and vigourously enforced. Cliched, badly thought out avatars should be KOS, and permits required for those ridiculous tattoes*. What does the NO say? *if found on by carebears trying to act tough. To answer your question, EVE Online is a game about spaceships. And The Code is a document regarding the conduct of players that engage in spaceship-related PvE Activities while operating in James 315 space. Unfortunately, because of this, and because there are no articles of clothing that one can purchase that affect the stats of a ship; (implants excluded) it is of the opinion of this Loyal Agent of the New Order and Servant of James 315 that a miner's personal choice of clothing is to be their own, since there are no articles of clothing (that I can imagine, anyway) that could be considered heretical. I dunno Ming. Tattoos on a miner, monocles on a freighter pilot, the hood and a shady look on the perpetually AFK and non-compliant. The offences against good taste are endless. Where's the night before Christmas poem? I loved that last year! So... black & blue or white & gold?